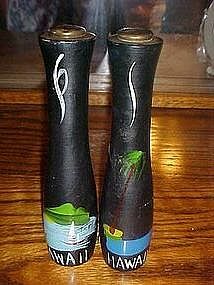 Great hand painted salt and pepper shakers are a souvenir of Hawaii. Made of wood an all hand painted. Scene of the island an palm tree. Measures 6 1/2" tall. Brass tops and plastic stoppers. Fantastic condition.